C. Apply the work done in “Task B” to other subsets. The reason to include python is that it automates the process in Tasks A and C, which is especially important with a large dataset. Whereas my previous two blog posts speak more to my own project, I hope this one can be helpful for a more general situation when you want to automate the OpenRefine workflow on many subsets. III. refine-python: a client library for interacting with OpenRefine in python (here is the link for its GitHub page, and yes, it’s still working under OpenRefine 2.6). Link for the hypothetical data used in this demonstration: Example_3Threads.csv (for simplification the time data is ready). What I thought I could do: Export subsets based on a facet of the column “ThreadID” in OpenRefine. Line 2: Create a dataframe from the sample csv file. Line 4: Locate a subdirectory under the working directory to store all split files. In OpenRefine, do the work covered in Part II on any one of the subsets. OpenRefine stores every step that changes the data in an operation history. 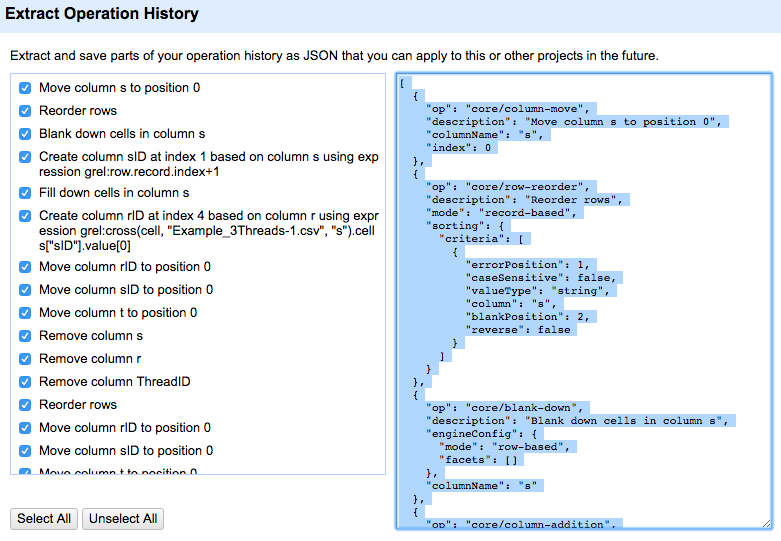 History of one project can be extracted, saved in JSON, and applied to other projects. Therefore, the logic of completing Task C is straightforward: C1. When Task B is finished, extract and save the history as JSON; C2. Use refine-python to automate the process of applying the operation history to the other two subsets. C2: Let python streamline the remaining process. Notes on directories for this demonstration: the working directory is “/python refine/,” where both “refine.py” and “OperationHistory.json” locate. Under “python refine,” “SplitFiles” stores split csv files from Task A, and “SplitFiles2” stores transformed csv files. # Loop through every csv file under the folder "SplitFiles"
# Export csv file to the folder "SplitFiles2"
exportfilename="Thread" + "_" + str(filenameindex) + ".csv"
In Part II (Step 6), there is a part of GREL’s cross() function that points to the working project’s name. Therefore, I have to update the JSON file in each loop so that the project names match. Lines 22-34 do this job (read, change, and update JSON). More specifically, when python reads JSON, it converts JSON’s content to a list of dictionaries. Locating and changing parts of the JSON content thus follows the way such a list is structured (lines 29-30, the two places where project name needs to be changed locate in the keys “description” and “expression” under the sixth dictionary in the list).